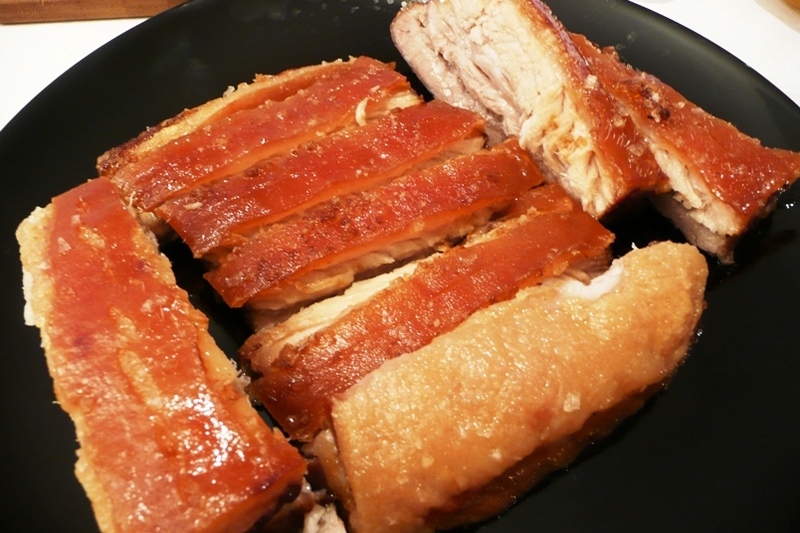 I asked which recipe you would have liked to have me share with you, and although I would love to say, “By Popular demand, let me present to you the Roast Pork Belly Recipe!”, I can’t… that’s because, everyone went for everything!!! Note: The Boy had actually forgotten the recipe, and because I requested it (the recipe) for this post, I got to eat pork belly again!! WuhOOO! Prepare brine with the above ingredients. Place brine and Pork Belly into a large plastic zipper-lock bag. Leave in refrigerator for 6 hours or not more than 8 hours. 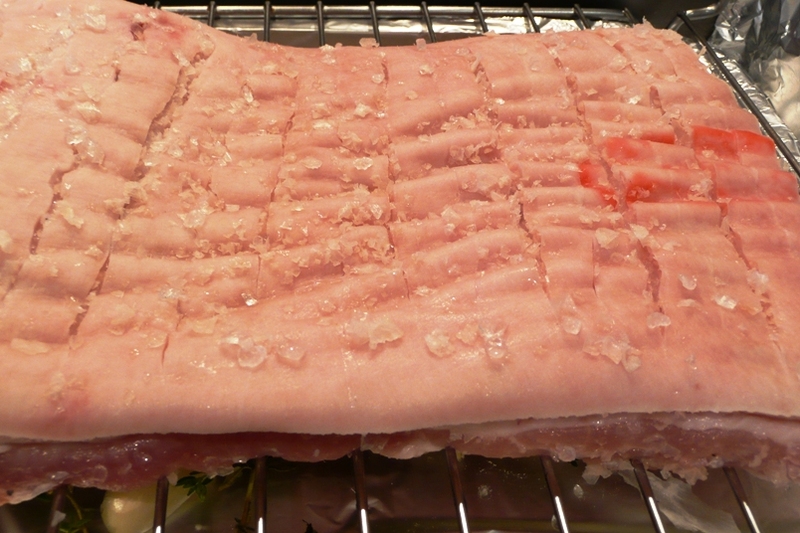 Take Pork Belly out and wipe dry (especially the skin). Leave it to air-dry (uncovered) in the refrigerator for a couple of hours. Preheat your oven to 220°C. Pour some water into the roasting tray (to a height of about 1cm) and place smashed garlic cloves and sprigs of thyme into it. Use a sharp knife to score the skin (approx. 1 cm apart). Rub sea salt all over skin and into the scores made. Brush away any excess salt. Turn over to the meaty side and rub with some salt and pepper. Turn it over again (skin side up) and leave it for 20 minutes. Pat dry any excess moisture from the skin with a kitchen towel. Rub with a little more sea salt. Place your pork (skin side up) into the roasting tray. 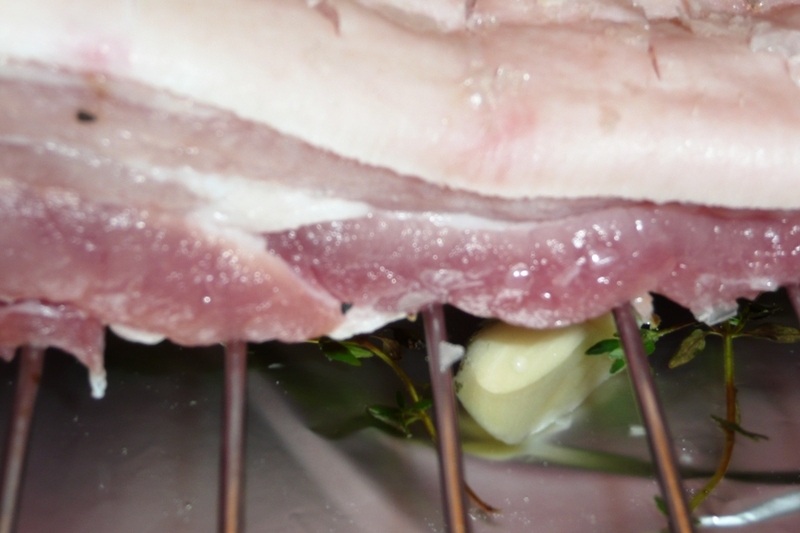 The pork should not be touching the water. Roast for 30 minutes on 220°C. 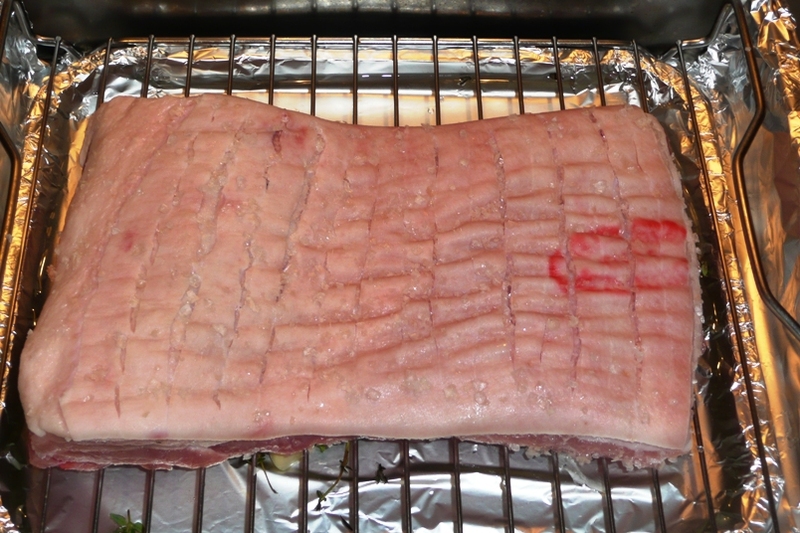 Turn the heat down to 140°C and leave it to roast for 2 ½ hours. Turn the heat down again to 120°C and roast for another 1 hour. Take the pork out and let it rest for 15 minutes. 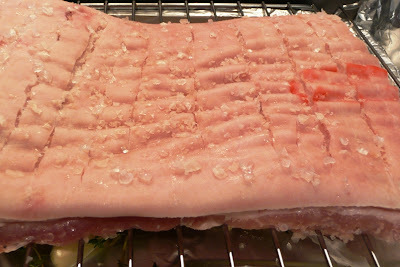 If the skin is not crispy enough, place the pork (skin side down) onto a hot grill and crisp the skin up. But be careful not to burn the skin. Let it cool before carving. 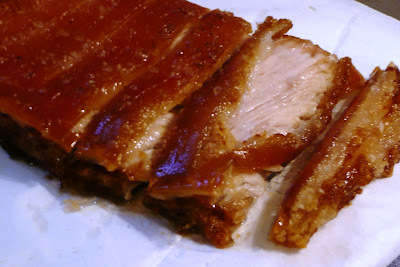 I hope you enjoy cooking this Roast Pork Belly and have as much joy as we did in eating it! I know I did!! I can't wait to cook this over the holidays!! mmm that looks amazing! 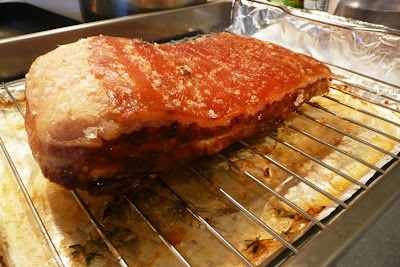 I love that picture of it once it is cooked and the crackling looks so crispy and the meat soooo soft! Damn, it's breakfast time and all I want is pork belly! 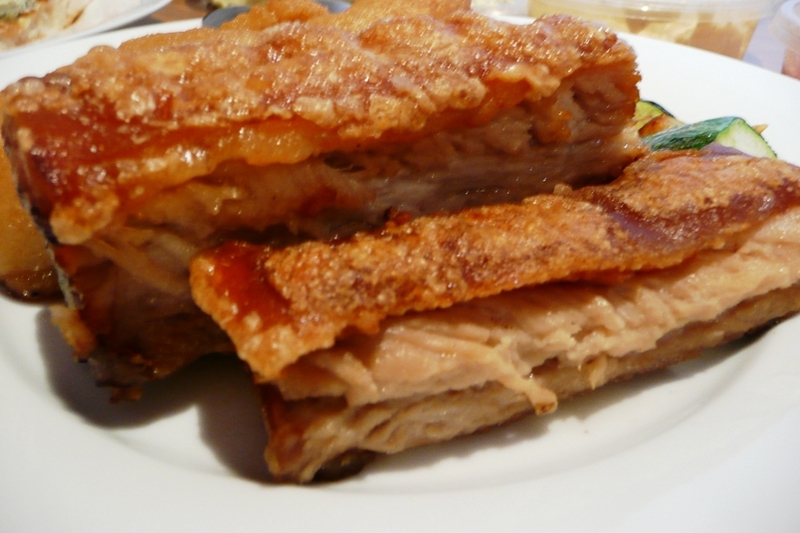 Lorraine: It was so good.. nothing wrong with crispy pork belly for breakfast, lunch or dinner! 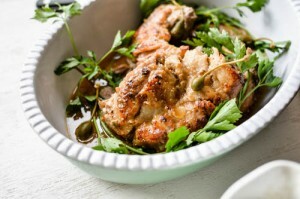 This looks so good, I think it's a perfectly acceptable breakfast dish! Conor: It was amazing.. and thank you.. I did have it for brunch! !